Another month has flown by! Next week marks 6 months since we opened the doors at Greenwood. 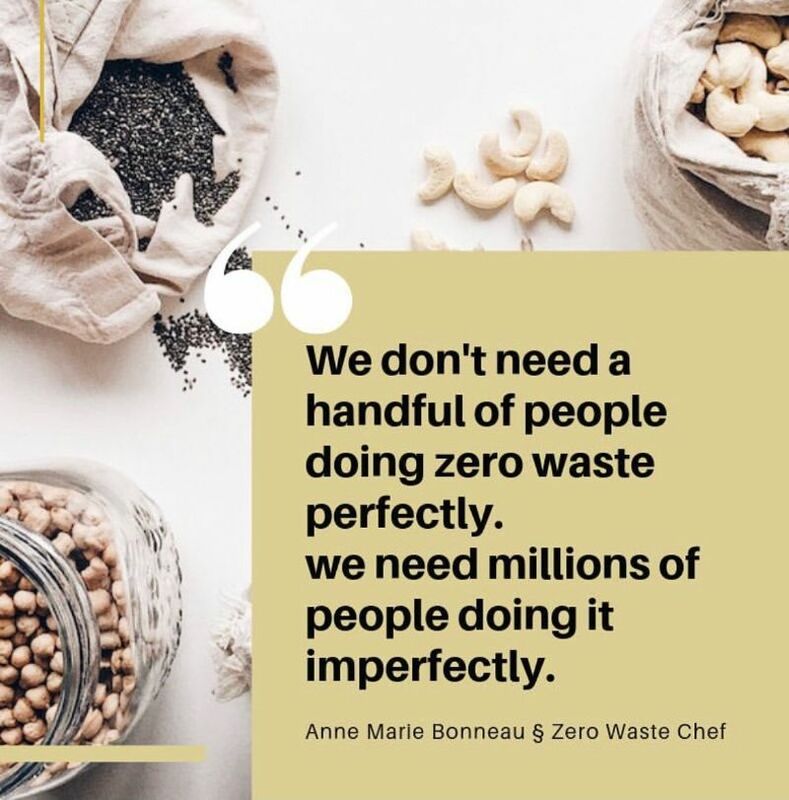 We are delighted to already have such lovely ‘regular’ customers and also feel very special when first-timers trust us to help them with their inagural zero-waste shopping experience. One of the most common things people say when they come in to have a look around the store for the first time is “I need to get more organised …”. I have been reflecting on this and I can certainly relate. It may be just me (though maybe not!?) but I feel there is a lot of pressure to do things perfectly, even things we are trying for the first time. We live in an age where we are bombarded with success stories and instagram-worthy photos. The pressure is on to have a ‘perfect pantry’ or serve a family meal every night that would win a TV cooking show. This reminded me of something my daughter learned long ago from her guitar teacher – progress not perfection. Just as we cannot pick up an instrument and expect to play it fluently from the first day, it takes time and practice to learn different ways of shopping, cooking and consuming. And if you don’t have to play (or reduce your waste) perfectly to make a difference. My advice is to just start somewhere – start small, be imperfect, learn as you go but, above all, just start. Perhaps, as you run out of something that used to be a source of waste, replace it with something that generates less waste. If there is no viable substitute (yet) pick something else and move on. Start small, start now! 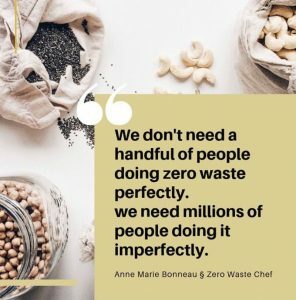 You may have already seen this photo from Anne Marie Bonneau & The Zero Waste Chef seemed to say it perfectly (lol) and the post is also worth a read. New products keep on coming! Thanks for all the additions to our wishlist. We have now added some more great new products to our range…They have arrived! Shampoo and conditioner bars from Narda at Perth Soapworks are in store now. The team and I have all tried them and cannot stop raving. We also have Narda’s soap called “Dude Rock” (which according to my daughters is not just for Dudes cos they love it!) After lots of requests for Vitamin E oil we now have it in our DIY beauty section.Wooden soap racks – great for making our lovely hand made soaps (and those new shampoo and conditioner bars) last longer between uses.The Family Hub Organics have created a luscious lightweight body lotion for us that you can grab refills of at your convenience. It contains organic ingredients, no palm oil, is vegan, and is available unscented or with a grapefruit scent depending on your preference. Their products are very gentle and suitable for the most sensitive skinNew stocks of unpaper towels have arrived in the cutest fabrics from our supplier who makes them here in WA.We are also looking into shifting even more of our products to local suppliers. Did you know that well over 300 of our products are made in Australia and quite a few of those like our Sprayfree pecans and white quinoa are grown right here in WA? With Easter around the corner, it would have to be Hot Cross Buns! See the recipe with loads of variations here. It was a real pleasure to have some students from The Montessori School in Kingsley visit the us this month to ask questions about starting a sustainable business within their school community. If your school has some sustainability initiatives that we may be able to help with, please get in touch. Next week we have Joe from Ethical Being co-hosting an after hours event to share how easy and fun it is to shop for yourself and the environment. Specialist recyclingOur last battery collection weighed in at a whopping 97kg so the team at MRC will be emptying the bin more often. Well done for keeping so many batteries out of your kerbside bin! Did you know that batteries in your bin can put put the drivers in danger as they can cause fires on the collection truck? You have also already contributed over 2kg of bread tags and three 20 litre bucketfuls of bottle tops, which are too small to be separated at the recycling facility. While many plastic bottles can be avoided altogether (cough cough, esp. water bottles) some are a bit harder to avoid so at least you can now keep the lids out of landfill too. Our Terracycle collections for Oral Care and Beauty products are proving very popular. However, pretty please can you remember to empty as much product as possible out of the containers first and, for the safety of my team and the Terracycle staff, please do not deposit razors/blades in any of the bins. Easter is comingI saved the best for last… we have some oh so tasty unpackaged easter eggs – small and egg-sized in both milk and dark chocolate. They are locally made and palm oil free plus the dark eggs are also dairy free so suitable for vegans. To make it easier to mix and match whichever ones you like, they are priced per egg rather than by the kilogram. The little ones are 45 cents each and the larger ones are $1.75 each. 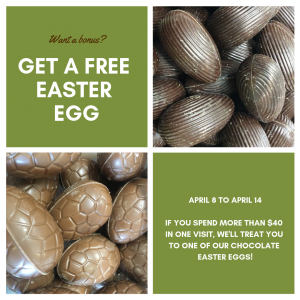 Next week, spend over $40 to get any one of our chocolate Easter Eggs for free! We also have some adorable reusable wooden eggs which can hold little treats (edible or not) and can be decorated. Perhaps the decorating could even become part of an Easter tradition in your family…? Until next month …All the best for making progress (not aiming for perfection remember!) with your waste-reduction efforts and remember we are happy to help where we can. See you in store soon!